Wine tasting is a charming way to spend time with friends or new acquaintances. Traveling is a beautiful thing that gives you stories and adventures. We enjoy both experiences very much, so we thought, why not combine them? Warm your your adventure-seeking soul and fill your tales with wine tasting experiences around the world. We put together a list of three unique destinations to have an unforgettable experience that every wine lover and travel enthusiast should add to their bucket list! If you’ve ever wondered what it would be like to taste a Sauvignon Blanc six meters under the sea, look no further than this one-of-a-kind spot in Maldives. Subsix, the world’s first “underwater playground,” is located approximately 500 meters off the coast of the Indian Ocean. A speedboat will whisk you out over the crystal clear waters, which is also home to a coral reef with more than 90 species, including damselfish, Moray eels, parrotfish and more. Descend a dramatic three-tier staircase to the restaurant, where you will enjoy wines from top growers in Champagne, Burgundy, Australia, and Tuscany, to name a few. Butterflyfish and hawksbill turtles swim into view as you sip beneath Italian chandeliers illuminating the room like shining coral. You might even find Nemo! For the high altitude seekers, venture to Mendoza, Argentina for scenic Andean mountain views and a taste of one of the greatest wine regions in the world. More than 1,500 wineries result in miles of vines and blue skies, sprawled across 350,000 and three main regions: Lujan de Cuyo, Valle de Uco, and Maipu. Lujan de Cuyo is “the land of Malbec” and considered to be the place where Argentina’s wine movement began. Acres of vineyards are planted in sandy soil at an altitude ranging from 2,600 to 3,600 feet. It is also home to grassroots winemaker Carmelo Patti. Ascend up to a delightful tasting experience when you visit Carmelo’s private property. It is here that he single-handedly produces internationally acclaimed Malbecs in a historical bodega in his garage. Carmelo is lovingly called the most passionate winemaker in Mendoza for his fervor of wine and people. With an infectious smile, Carmelo will take you on a personal tour of his charming home, animatedly explaining his processes and sharing his story. Enjoy a tasting of Malbec or Cabernet Sauvignon straight from the barrel as you take in the scenic Cordillera de los Andes (Andean Mountains). Carmello’s charm and passion is sure to linger on your palate. Italy — the land of buonissimo pizza, gelato, art, history, love, and… free wine! Start planning your next vino experience in Italy, specifically the Abruzzo region, and visit the Fontana di Vino at Dora Sarchese Vini. Be a part of history as you travel along a portion of the 196-mile Italian pilgrimage route of Cammino di San Tommaso. Thousands of pilgrims and tourists make this trek each year from Rome to Orton to visit a cathedral with the remains of St. Thomas the Apostle. Dora Sarchese vineyard is a dream destination along the route in the small town of Caldari di Ortona. Just a few miles before the end, a fountain that flows 24 hours a day with locally grown, locally made red wine. Travelers can stop and quench their thirst with a free glass of wine from the fountain, located just outside of the tasting room. 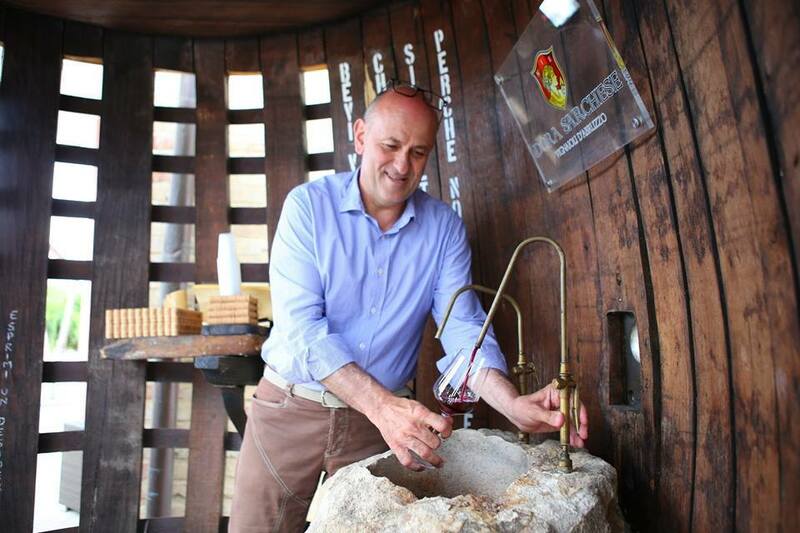 The fountain was erected several years ago as a partnership between the winery and a local nonprofit that maintains the Cammino di San Tommaso. The hope is to draw more travelers to the pilgrimage route that dates back to 1365. While you technically can refill your glass, organizers kindly ask you to be responsible and respectful of this unique experience! What’s even better than traveling to these unique wine destinations? Bringing home souvenirs. With the VinGardeValise® suitcase, you can safely bring home a bottle — or several! This suitcase is the world's first designed exclusively for safely transporting wine. You'll be able to sip on Mendoza Malbec and reminisce from the comfort of your own couch. The easy part is ordering one before you jet set on these unforgettable wine adventures. The hard part is choosing where to travel to first! There you have it, three of the most interesting places you can enjoy wine in the world. Don't just take our word for it...Get out there and see it for yourself! We may just bump into you and cheers a glass! Did we miss anything? Let us know your favorite worldly wine tasting.